Taken by the Vikings in the first round of the 2007 NFL draft, Peterson made an immediate impact as he rushed for 1341 yards as a rookie, including a single-game record 296 yards against San Diego. If there was any downside, it came in the knee injury that caused him to miss two games, his lesser numbers as defenses stacked the line to stop him when he returned, and his mediocre pass blocking. Still, with his speed complemented by power, he was named Offensive Rookie of the Year and was selected to the Pro Bowl. 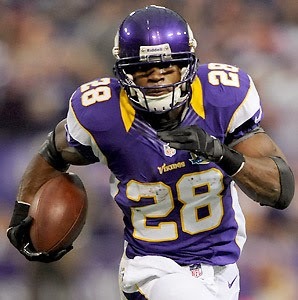 Peterson followed up by leading the NFL in rushing (1760 yards) and yards from scrimmage (1885) in 2009 and received the Bert Bell Award as well as consensus first-team All-NFL and Pro Bowl honors. In 2009, he compiled 1383 rushing yards and a league-leading 18 TDs while also catching a career-high 43 passes as the Vikings went 12-4 and advanced to the NFC Championship game. While a tendency to fumble was still a concern (he lost the ball 9 times in 2008 and 7 in ’09), Peterson was again a consensus first-team All-Pro and was named to the Pro Bowl. Turmoil touched the team in 2010, which dropped to 6-10, but Peterson was a bulwark who ran for 1298 yards, scored 13 TDs, fumbled only once, and was selected to a fourth straight Pro Bowl. However, it appeared that his career was in jeopardy when he went down with a torn ACL twelve games into the 2011 season that required surgery. Vikings went 10-6 to finish second in the NFC North and qualify for a Wild Card playoff spot while ranking second in the NFL in rushing (2634 yards). Lost NFC Wild Card playoff to Green Bay Packers (24-10). Following up his remarkable comeback in 2012 that nearly resulted in a new NFL rushing record, Peterson ran for 1266 yards in 14 games in ‘13 and had 1437 yards from scrimmage. Through the 2013 season he had rushed for 10,115 yards on 2033 carries (5.0 avg.) and caught 206 passes for 1697 yards, totaling 91 touchdowns. He has been a consensus first-team All-NFL selection on three occasions, received at least some first- or second-team recognition after three other seasons, and has been named to the Pro Bowl six times in seven years.